It was fifty years ago in London that Jack Chambers, Tony Urquhart, Kim Ondaatje, Greg Curnoe and Ron Martin came together to form the first Canadian Artists' Representation (CAR) Executive, and a piece of Canadian history was born. In 1968, CAR was established in response to artists' perception that their crucial contribution to society was not fairly compensated. As a result, CAR established minimum fee schedules outlining recommended rates for compensating artists, a practice which CARFAC continues. It was because of the early activism of CAR members that in 1976, Canada became the first country in the world to pay exhibition fees to artists, with the Canada Council for the Arts making payment of fees to artists based on the CARFAC fee schedule a requirement for eligibility for funding to public art galleries. After many more years of lobbying, the Copyright Act was amended in 1988, recognizing artists' role as primary producers of culture by giving them legal entitlement to exhibition and other fees. Today, CARFAC and its provincial affiliates work on many of the same issues, ensuring that artists are fairly compensated for the valuable contributions that they make to society and that artists ' rights are respected by those with whom they engage in business. In addition, CARFAC and its affiliates have developed programming, publications and products to help artists reach their professional goals. 1968 – CAR issues the first Minimum Exhibition & Reproduction Fee Schedule outlining appropriate professional exhibition fees. Early ‘70s – Steady lobbying by CAR members results in Canada becoming the first country in the world to pay exhibition fees to artists. 1988 – Federal Copyright Act amended to recognize artists as the primary producers of culture, giving artists legal entitlement to exhibition and other fees. 1992 – Federal Status of the Artist Act proclaimed, recognizing artists as professionals. 1999 – CARFAC certified to represent all visual and media artists outside of Quebec, allowing negotiations of collective agreements with federal institutions (i.e. the National Gallery, the Museum of Civilization) on behalf of Canada's artists. 2007 – Status of Ontario’s Artists Act passed recognizing artists’ contribution to the Province as a result of three years of advocacy and participation in a province-wide consultative process. 2007 – CARFAC National, along with RAAV (Le regroupement des artistes en arts visuals du Québec) signed an unprecedented MOU (Memorandum of Understanding) with CAMDO (The Canadian Art Museums Directors' Organization) and the CMA (Canadian Museums Association) regarding the minimum recommended fee schedule. 2008 – CARFAC partners in forming the Visual Arts Alliance (VAA), an independent alliance of national visual arts organizations determined to advance the status of visual and media arts in Canada. 2010 – CARFAC launches major advocacy campaign aimed at incorporating the Artists Resale Right into federal copyright legislation. 2010 – 11 – CARFAC Ontario successfully negotiates the blending of services with Visual Arts Ontario and becomes the sole Arts Service Organization representing the interests of visual and media artists in the Province. These assets are under the direction of CANVAS, CARFAC Ontario’s sister foundation. 2014 – The National Gallery of Canada and the CARFAC (Canadian Artists’ Representation / Le Front des artistes canadiens) and RAAV (le regroupement des artistes en arts visuels du Québec) have reached an historical agreement in principle on terms and conditions for the exhibition and the reproduction of works of art, as well as the provision of professional services by living Canadian artists at the National Gallery of Canada, pursuant to the federal Status of the Artist Act. 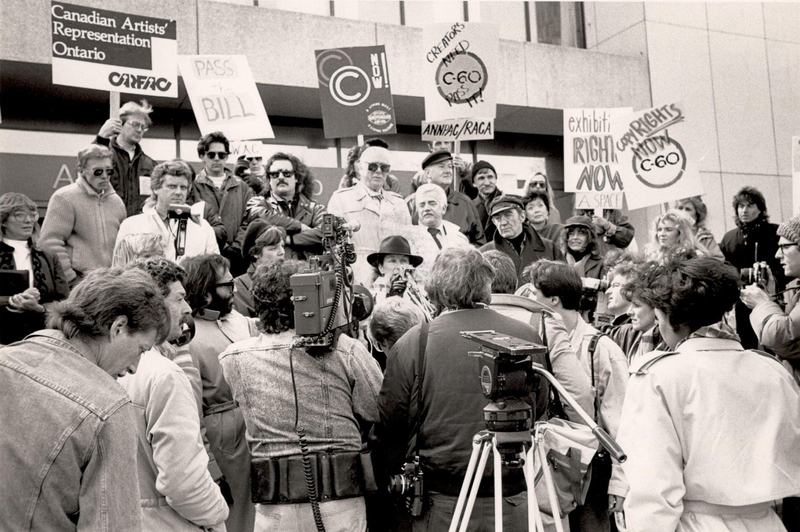 Copyright Demonstration at AGO April 1988 in Toronto. Content: the person speaking is Margaret Atwood. Behind her in sunglasses may be Pierre Berton. To the right of Berton in the black leather cap is Ron Bloore. At back L. under the word “Bill” is Kim Tomczak.” David Renaud back row left with sign.